Bundle up and win big when you play the chilly Arctic Madness Slots! There’s a rewarding bonus feature, Wild symbol and cascading reels to keep you winning big! 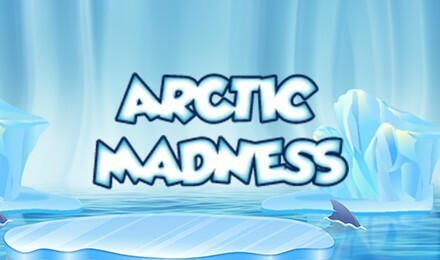 Spin to win Arctic Madness Slots today! There are cascading reels, which give you loads of chances to win, a Wild that can help complete paylines, and a Bonus Feature that you will activate when 3 wrapped boxes appear on the reels! When you spin a winning combination, the large ice boxes will break, freeing the colourful characters from inside. More boxes will replace the broken ones continuously until there are no winning lines across the reels. Good luck!